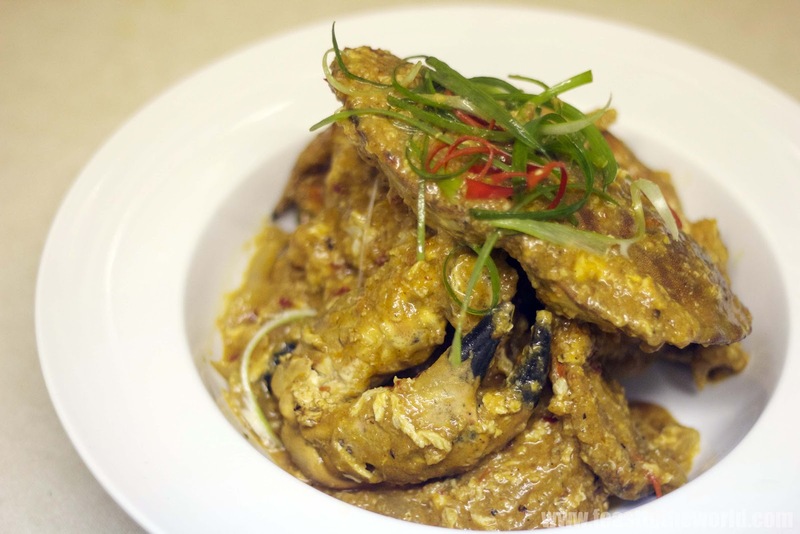 Singapore Chilli Crab - one of the true classic seafood dish that has come represent the best of Singapore cuisine and quite rightly so. 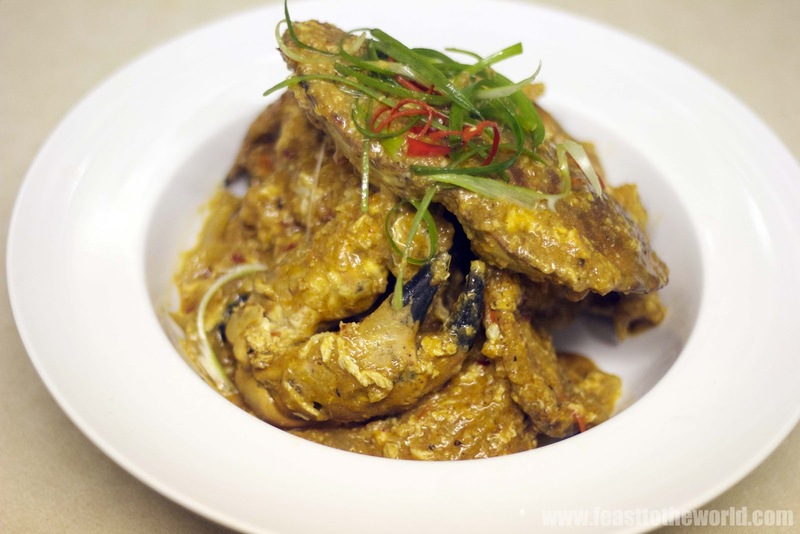 This saucy beauty of a dish make use of the freshness of the crab which is at it's sweetest and coat it with a hot and spicy gooey sauce that just enticed you into mopping it all up with the accompanying crusty bread or in some case, crispy fried mantou (yeast buns). 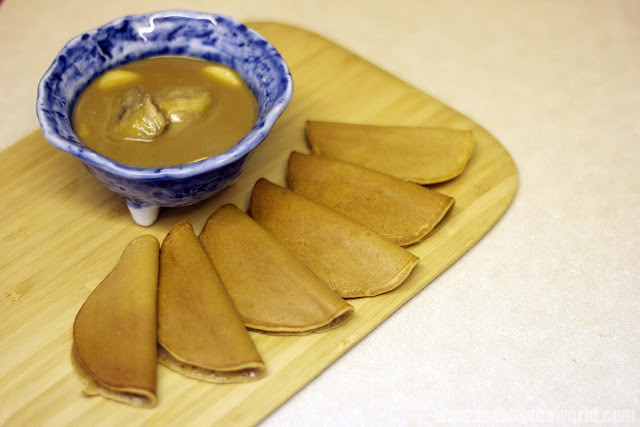 I remember those days when I used to savour this dish in the famous and long standing Long Beach seafood Restaurant in East Coast park, Singapore where all the live seafood would be exhibited in full view in the rows of fish tanks surrounding the restaurant. Obviously the crabs will be the main attractions of many who visits and I was one of them. 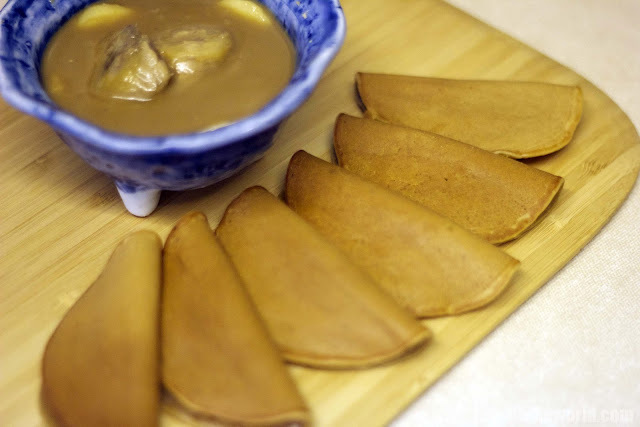 There are many variations to create this wonderful dish and this is one of mine. 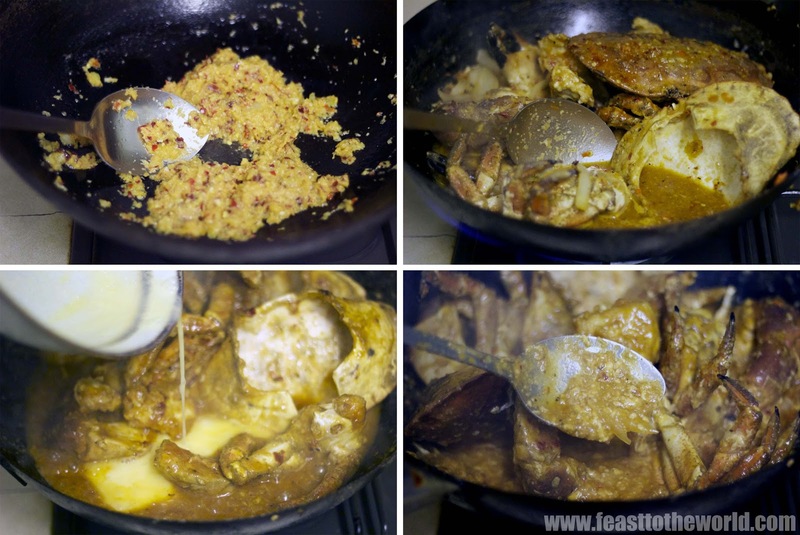 I like to dredge the crab in flour and then deep fried them first as I think it helps the sticky sauce to cling well onto crustaceans when cooked, all the more better as the sauce is what make this crab dish so incredibly irresistible. For this dish, the crabs should always be bought live if at all possible though this I find is much easier if you pop down to a good fishmonger or Chinatown. The best variety to get is the Chinese freshwater crabs which have distinctive hairy claws and autumn is the best time to look out for these in most Chinese supermarket as this is when they are at their juiciest and finest. In Singapore, the most common way to kill a crab is to insert a chopstick deep inside its mouth opening. But I tend to put it into a freezer first for about 20-25 minutes to induce it into a sweet gently coma before laying it on its back on a chopping board, lift up the flab from the underside belly and inserting a knife straight through the dent in one go. Next pry off the top shell. Remove the back and the spongey innards and dead men's fingers. Remove the claws from the main body and make a few cracks with the back of your knife (or in my case, the pestle). This will help with the cooking and eating later. Cut the remaining body into 2 pieces, leaving the leg attached. 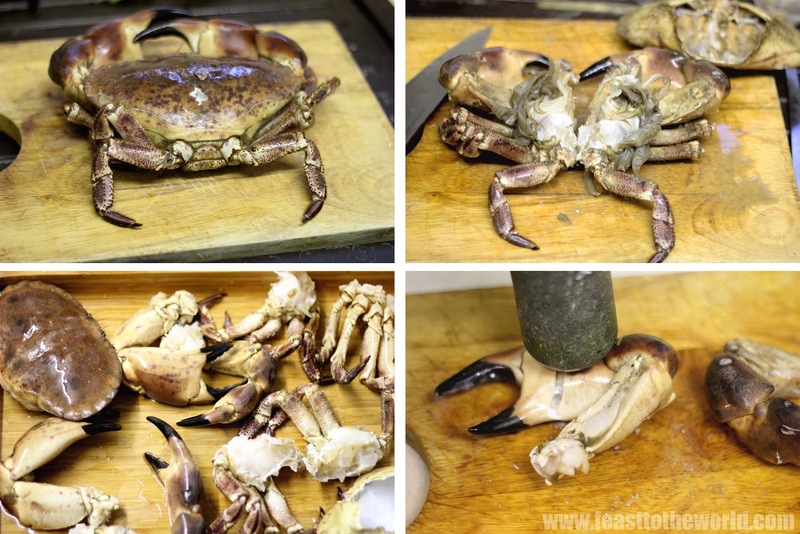 Wash and pat dry completely and now you are ready to cook up a perfect crab heaven, believe me, this is good! Pound all the ingredients for the ginger spice paste in a mortar and pestle inot a smooth paste or alternatively, blitz in a food processor. Heat some oil in a wok until very hot. 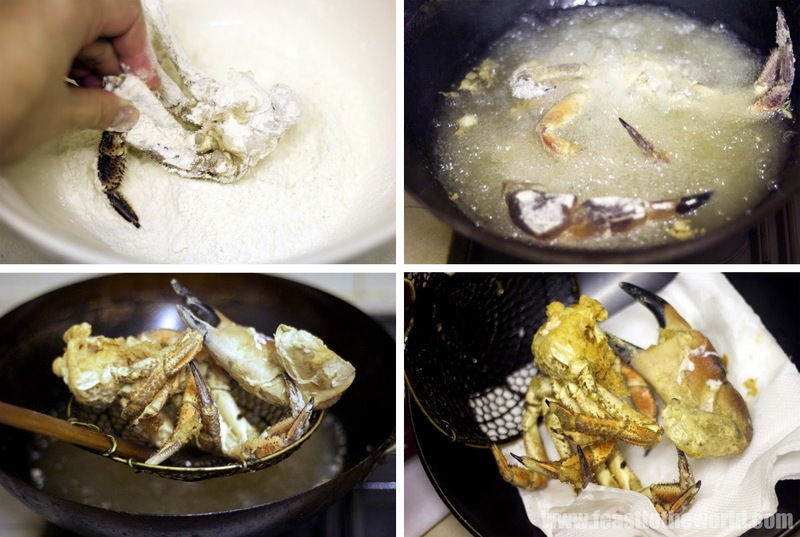 Lightly coat the crab pieces in flour and deep-fry them for 2-3 minutes, few pieces at a time. Remove and drain on some kitchen paper. Pour away the frying oil. Clean and return the wok to the heat. Add 3 tablespoon of oil and heat over medium heat until smoking. Add the ginger spice paste and stir-fry for 3 minutes, until fragrant. Add the onions and cook for another minutes before adding the crab pieces. Turn frequently to coat the crab in the aromatic spice paste. Add the ketchup, chilli sauce, tamarind, water, sugar and season with salt and pepper to taste. Bring to the boil, lower the heat and simmer for 3-4 minutes, until the crab are cooked through. Add the corn flour mixture and stir to mix well, the sauce should starts to thicken. Slowly stir in the beaten eggs, give a final stir. Turn off the heat when the eggs start to set. You should have a thick, creamy, curdled sauce, fret not, this is how it is meant to be. Transfer to a serving dish, garnish with the spring onion and chilli and serve hot with lots of crusty baguette or in true Singapore style - fried mantou. Wings are an addiction of mine, just like fried chicken. I have spent many-a-nights curbing my cravings with attempts to come up with a top notch recipe that will showcase these little meaty lollipops to their best effect. 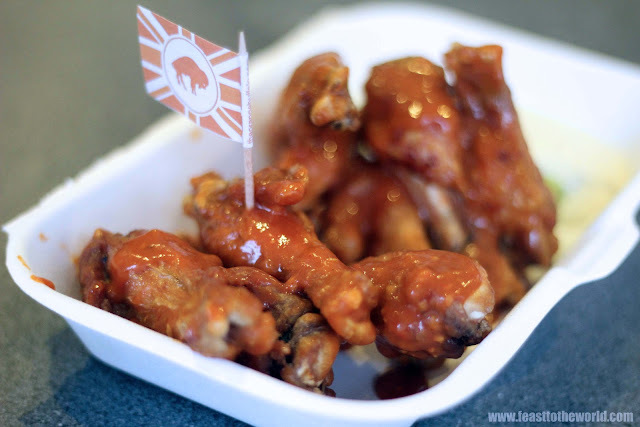 But the truth is, I love them in all their incarnations - see my late night spicy wings. 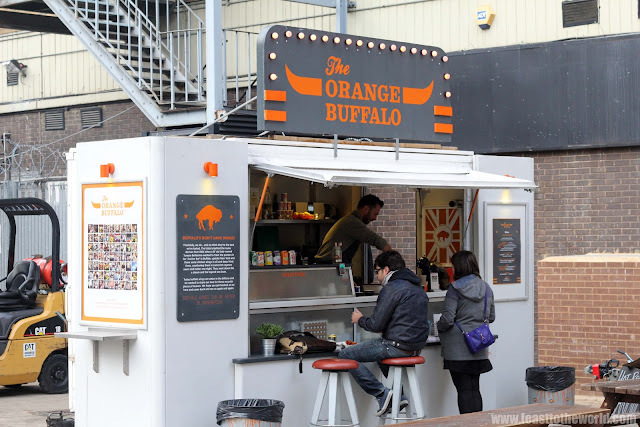 Now when I got wind of a street vendor selling some bonafide New York Buffalo Wings, my inner wings radar dragged me all the way to Liverpool Street station and a moments later, I find myself being confronted by this alluring aroma, whiffing through the cold icy air. 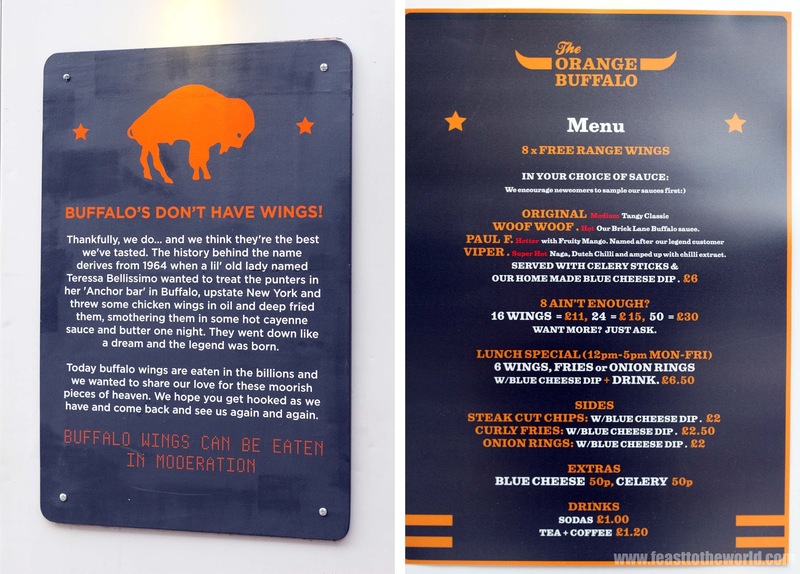 So what are buffalo wings? It is believed to have originated from the Anchor Bar in New York in 1940 by the Bellisimo family. The chicken wings are first deep fried and then coated in a fiery sauce, served with celery baton and blue cheese dipping sauce. Now doesn't that sounds delicious and that was precisely what is on offer here at The Orange Buffalo. For a mere £6, you get 8 pieces of free range wings (from Smithfield Market) deep-fried to order before your very eyes. These crispy batons are then drenched in the sauce of your choice. All the four sauces on offer are homemade with different intensity of 'hotness' ranging from the medium 'Original' to the wonderfully named hot 'Woof Woof', an ever hotter 'Pawl F' and the pièce de resistánce, super-hot 'Viper' featuring the scorching Naga chilli as one of it's killer ingredients. Being the chilli fiend as I am, I went for the half and half of the hottest two, Paul F and Viper. Nick (the vendor) even adorn the viper wings with a stick of the Orange Buffalo flag, which made me felt a bit like Adam Rickman (of Man Vs Food) in one of his hot wings challenge here. The wings were flavoursome and lean, with just enough meat to allow the sauce to be the equal star and not just an inferior side-kick. Paul F were slight sweet and fruity with a tinge of chilli kick which, although were good, will have to play second fiddler to the stinging Viper. 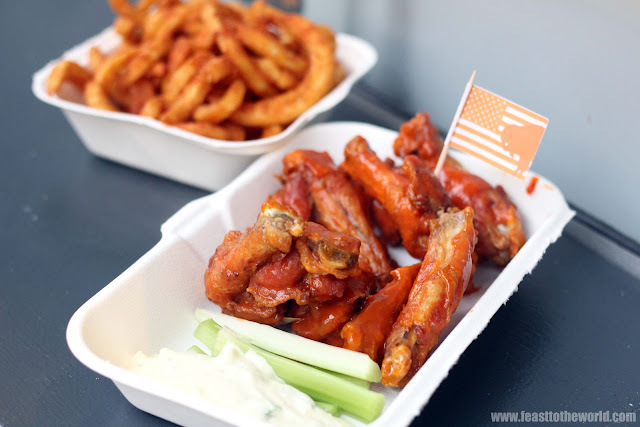 It's punchy kick and tanginess paired well with the crunchy skin and tender meat of the wings, just hot enough to allow you to savour the brilliant combination without having to chug down pints of ice cold beer to ease the pain. The accompanying rich and creamy blue cheese dipping sauce help with cooling down the heat. 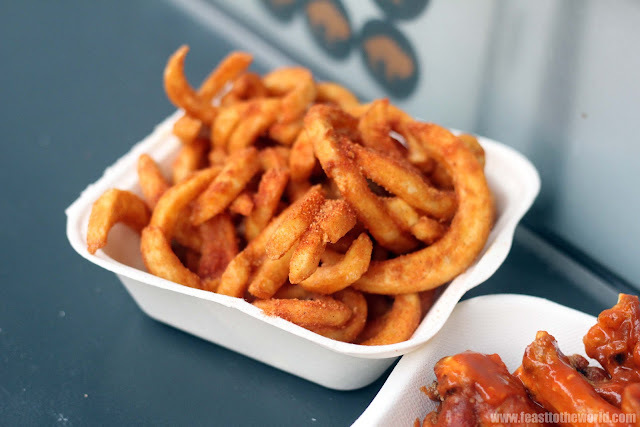 Like most street food, these are messy business, so expect to be smother in gooey sauces and be prepared to lick your fingers. There were paper towels on the premises but why on earth would you let the sauce go to waste? It belongs in your mouth and not on some dead trees.